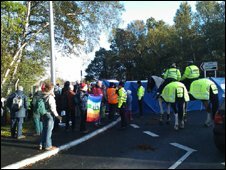 More than 30 people were arrested when anti-nuclear protesters blocked entrances at the Atomic Weapons Establishment (AWE) in Berkshire. Campaigners said hundreds of people gathered at Aldermaston to mark the start of World Disarmament Week. They are concerned the facilities are used to design and manufacture a new generation of nuclear warheads. Thames Valley Police said 33 people had been arrested and some roads had been blocked but were cleared later. AWE provides the warheads for Trident - the submarine-launched missile system that constitutes the UK's nuclear deterrent. The protest was organised by Trident Ploughshares and supported by Campaign for Nuclear Disarmament (CND), Block the Builders and the Aldermaston Women's Peace Camp group. Officers from Thames Valley Police, the Ministry of Defence (MoD) and Hampshire Constabulary, including horse mounted officers, were at AWE "to facilitate lawful protest, deal with any individuals who break the law, and ensure the safety of the public". A spokeswoman for Thames Valley Police said the protest, which started at 0600 BST, had been peaceful with no violent incidents. Kate Hudson, chairwoman of the CND, said the gates were blocked by protesters "peacefully sitting and lying in the road, some locked together with concrete, glue, climbing clips and chains". "Today's action at Aldermaston has been a great success," she said. "We have effectively obstructed work at the site for many hours, closing gates and blocking roads. "This is the largest blockade of Aldermaston for many years and signals an increased public concern about Britain's weapons of mass destruction. "At a time of economic crisis, our government is prioritising nuclear bombs over healthcare, job creation and investment in sustainable energy production." Ch Insp Robbie Robbins, from the Ministry of Defence Police, said: "We take the responsibility of public safety seriously and wanted to ensure that disruption to the community was minimised. "Officers ensured that everyone who attended could exercise their right to engage in lawful protest, while at the same time making sure that members of the public could go about their normal day-to-day business."